Running parallel with the much vaunted and frankly obvious Old Bond Street down to Piccadilly is the stunning Burlington Arcade. Not content with just supplying his wife with one of Britain's first shopping Malls the good Lord went one step further by installing guards to protect the patrons and uphold standards with in the Arcade. Resplendent in their Edwardian frock coats and gold braid, men brought from the family regiment of the 10 Hussar's, became the smallest private police force in the world ensuring there was, and still is, no whistling, singing, busking or even running in what is still the longest and most beautiful covered shopping street in Britain. These custodians, known as Beadles still watch over the Arcade, though maybe more 'approachable' than in bygone days, in fact feel free to test their knowledge of London as they are rarely proved wrong, are still prepared to eject anyone not respecting the traditions of this historic landmark. 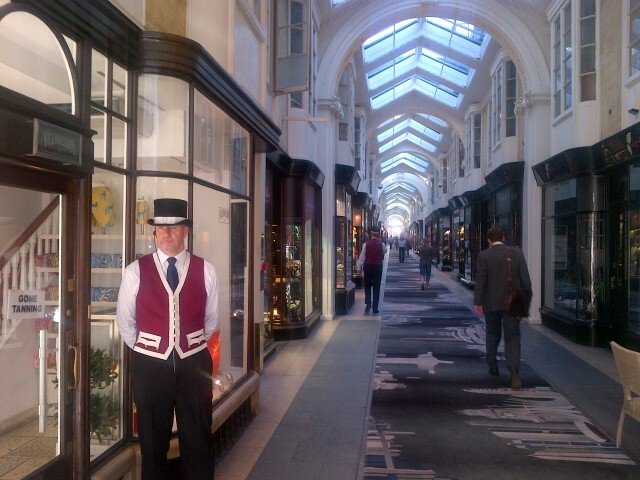 Visiting Burlington Arcade is a must, treading the carpeted, yes carpeted, corridor is tranquil and inspiring. You tend to stroll as if you where in a cathedral or museum, in some ways you are, you can smell the history...that or its the excruciatingly expensive hand bags and jewellery on display behind crystal clear glass. Yes, the Arcade was built by aristocracy and from a shopping perspective maintains the upper class standard. Hancock the jewellers designed and then produced every one of the 1350 Victoria Cross medals and the boutiques including that of Lulu Guinness and David Duggan are generally not for the pockets of the masses but then dreaming and drooling are not, to the best of my knowledge, enforced by the Beadles. A visit will put you in good company as Burlington boasts a very famous guest list from the Prince Regent to Ingrid Bergman, Gladstone to Fred Astaire through to Percy the Poltergeist, who in 1952, allegedly, rearranged briefcases and handbags for the residents at No. 42. Like all good disclaimer's, 'other Arcades are available' Princes, Piccadilly and Royal to name a few but, in my opinion, non quite measure up to the one built because of one mans love for his wife.